Per my post last week I am doing research on an upcoming class I’ll be teaching on major exhibitions in art history. While researching the seminal exhibit at the MOMA in 1936, Alfred Barr’s Cubism and abstract art: Painting, sculpture, constructions, photography, architecture, industrial art, theatre, films, posters, typography, I happened upon the press office archives from MOMA. There I found an extensive list of events, announcements and general goings on at the museum in the year 1936. Besides being sufficiently dizzy to the sheer amount of work being done, and to note that they were not yet in a huge building, instead in an apartment of sorts in the early years, I happened upon the most exciting piece of news in the bunch. 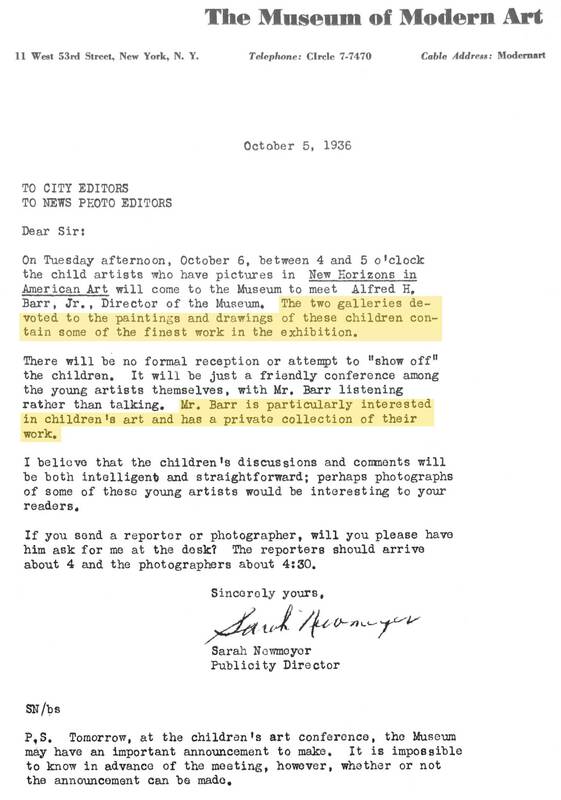 A press release announcing a show of children’s art at the MOMA! “The two galleries devoted to the paintings and drawings of these children contain some of the finest work in the exhibition….Mr. Barr is particularly interested in children’s art and has a private collection of their work.” Press letter from 1936 courtesy MOMA archives. So while Alfred Barr was setting up the nomenclature and foundations for the structure of the next 50 years of art history, he was also amassing a collection of children’s art. Not only did he personally collect art, but he initiated the acquisition of nine works from this particular exhibit called New Horizons in American Art. The works, listed below, included titles such as ” Fruit”, “Yentas”, “Deep Sea Diver”, and “The Butcher”. I am anxious to know what they look like – could they still be in the collection somewhere? Amazing if yes. I too collected children’s art before I had children of my own. In fact I found the work so compelling that I even had the works donated by kids to raise funds at auctions. And yes, I did consider a bidding war on occasion for special pieces, and some of the drawings by kindergarteners and 2nd graders neared the $2,500 mark. 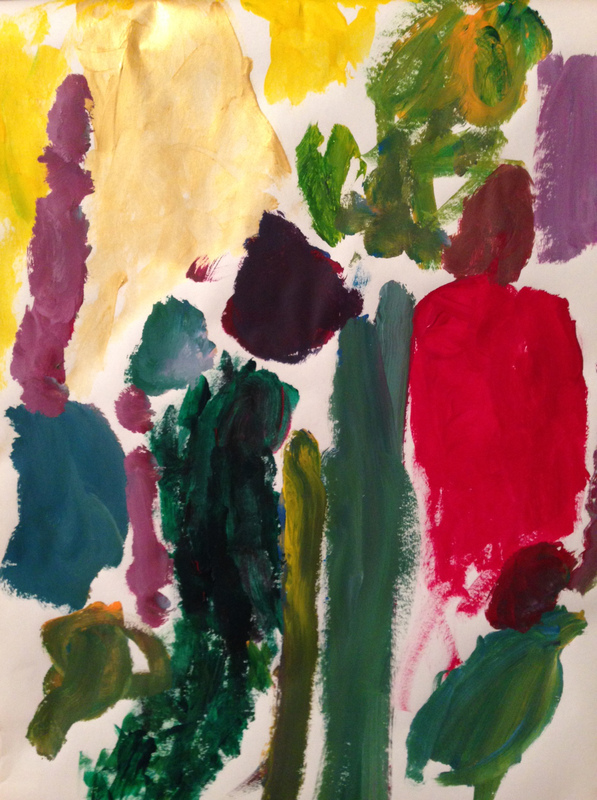 Courtesy of the author’s 5-year old son, painting is acrylic on butcher paper on IKEA easel done yesterday. I now have three artists, all very young and have not yet hit that awful shelf of insecurity – I believe it’s officially age 9 – where they claim they can not draw, dance or sing. Now, I’ll simply remain in awe and complete jealousy of my children’s lack of boundaries and abandon. As they doodle and paint, I will try to soak up their confidence and incredible energy. And yes, I will be archiving the best pieces, never to be auctioned off, but maybe considered for another MOMA exhibit. How fun would that be?? “The paintings of children have for many years been admired by modern artists, and by those interested in modern art. The unconventionality, the directness of technique and the imaginative freedom which many children show in their work has often been the envy of grown-up artists.” Press release from 1936 courtesy of the MOMA archives.